How many does it take to create the Best Way for a small business to create, maintain and market a website that will attract more clients, increase their satisfaction and make them more money? 1) It takes Independent Owners. Independent Owners provide the rock-solid foundation of that personal touch for small business owners. We are a growing company, but our model ENSURES that you will NEVER be treated like a "number." Our independent owners are stakeholders in this process. We realized the need for a powerful program and created it. However, we also realize the need for small business owners to have local, "touchable" people within their reach. This is why our program works like it does. Without an independent owner, Best Way Websites will not operate. Providing the Best Way means providing small businesses with people that not only know their local areas and the industries that they server, they need to know the PEOPLE that own those small businesses. You've got an independent owner, a personal advocate "in your camp." 2) It takes a Powerful Program. Your local area licensees or independent owners have the best tools available on the market today. It is only available through them. 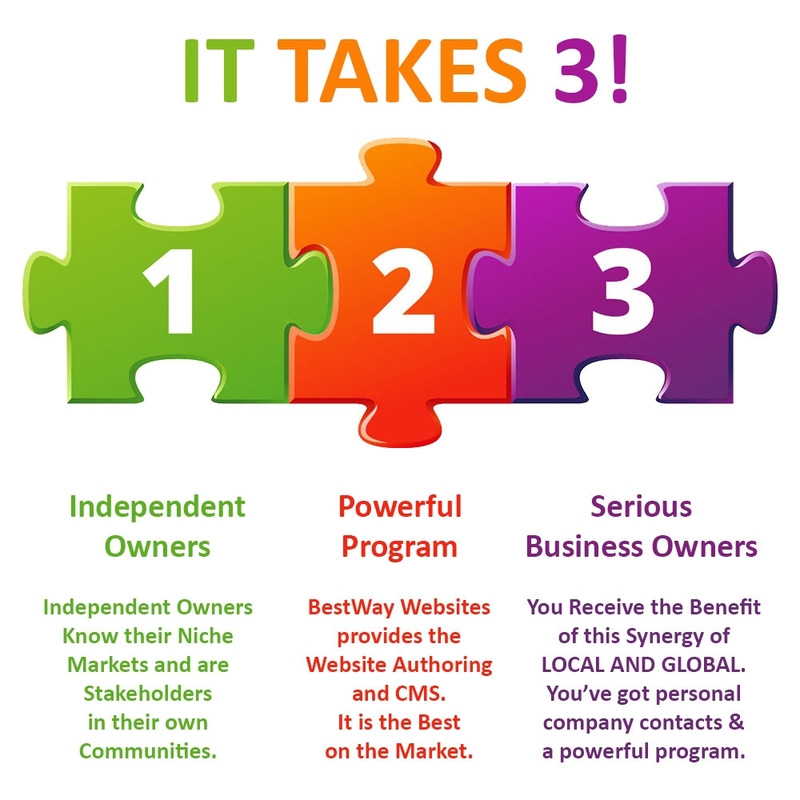 Best Way Websites does NOT direct market, we only provide software and support for our independent owners. Without you, we don't have anything to do! It takes you understanding the genius of the synergy of Independent Owners + Powerful Program + You! It takes smart small business owners like yourself to discern the relationship between cost and value and to realize that "cheaper" is almost never BETTER. It's only cheaper. It takes YOU taking advantage of our offer of a Free, expert phone consultation, followed by a Free, custom website demonstration.